The Backwoods Brute HD Rear Bumper brings a massive bang-for-your-buck with the rising prices for heavy duty rear bumpers. This Brute Series rear bumper is manufactured from 1/4" and 3/16" premium American steel, and provides superior looks and functionality to the rear of your vehicle. The Backwoods rear bumper is offered with and without holes for parking sensors depending on if your truck has them or not. 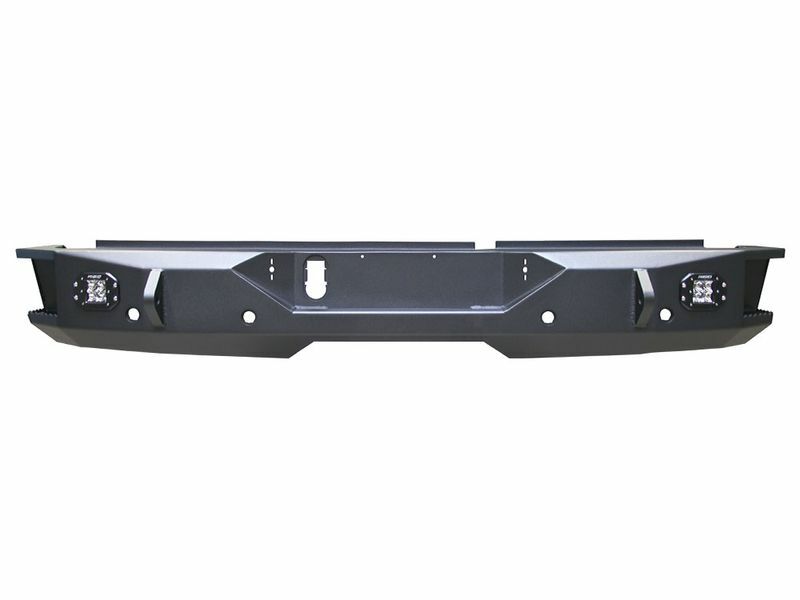 Also, this bumper is available in both a 2-stage satin powder coat finish and raw, which is perfect if you plan on getting it powder coated by someone locally. On each side of the bumper are cutouts perfect for Rigid D-Series Flush Mount LED Pods, and together, provide superior lighting whenever they're on. Backwoods Bumpers come with a limited lifetime warranty that covers any manufacturer defects that may happen. That means you can be confident while purchasing that you will have a great product and be in the hands of a great company if anything were to happen. So what are you waiting for? Pick up a Backwoods Brute HD Rear Bumper, and start your adventure in style.